In 2010, Twitter became a truly global phenomenon with 25 billion tweets, some of them quite powerful. But most of its growth came form overseas. If you look at a comScore chart of U.S. visitors to Twitter.com (see above), it looks like Twitter’s growth in the U.S. is stalling. 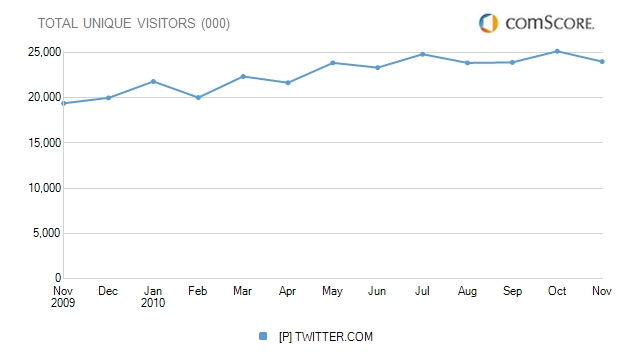 In November, Twitter.com drew an estimated 24 million unique visitors, down from 25.1 million in October. Unique visitors are still up 24 percent from a year ago, but there has been zero growth since July. Globally, however, Twitter.com attracted an estimated 104.6 million visitors in October (the month with the most recent data), up 79.4 percent from the year before and still growing at a steady clip month-over-month. These numbers are not the same as total users, which Twitter counts at 175 million (not all users go to Twitter.com, many use desktop or mobile clients, but the comScore numbers are a good proxy for Twitter’s overall health). Another way to look at it is in the year that Twitter.com’s overall audience grew by 46 million people across the world, only about 6 million of those new visitors came from the U.S.
Pageviews in the U.S. are up 23 percent annually, in line with visitor growth. But one encouraging metric is that time on the U.S. site is up 48.5 percent, which indicates that users are finding the new design which rolled out last October to be more engaging. I know I use Twitter.com much more than I did before the new design. Still, at 24 million U.S. unique visitors, that makes Twitter.com about the same size as Yelp, and smaller than LinkedIn (28.5 million) or the Huffington Post (26 million). Twitter needs to reignite growth in the U.S. if it wants to ever be in the same weight class as Facebook (152 million U.S. visitors).